“You are really complex beings, and the sequence by which each of you becomes aware of what you are is not exactly preordained, but does follow a regular pattern. We mentioned in a recent lesson how you are accompanied and assisted by representatives of the Trinity—myself representing the Eternal Son, pouring out upon you my unique spirit, the Spirit of Truth, to become part of your mentality giving you a hunger and drive to discover ever larger realms of what is true. Mother Spirit represents the Third Person of the Trinity, the Infinite Spirit, her Mind Adjutants, distinct dimensions of her consciousness, directing the evolution of life on the planets--which you recapitulate in the womb; and then from the moment you are born, as you recapitulate the history of your race, her adjutants, one by one, help you think, and understand, give you a gregarious impulse with respect to each other, and the courage to seek out this new world surrounding you--until you grow into that moment when her adjutants of wisdom and worship can inaugurate you into your first moral decision, at which moment your receive a Thought Adjuster, the presence of God himself, and become even as a small child super-minded. Yet even before these exterior spiritual influences, my children, your very being is reflective of the Trinity. Your personality, which we define as your essential reality, the unique cosmic reality that you are, like no other in all of existence, this personality is a creation of God. Then this creation of God the Father is bequeathed a spiritual nature from the Eternal Son, the Second Person of Deity. You are not only part of God’s personality circuit, you are also a part of the Eternal Son’s spiritual circuit. And then you are minded, you are extended a portion of the Infinite Spirit’s mindedness—the Cosmic Mind, just as part of your intrinsic nature, the kind of being you are. This mind’s main purpose is to link your spiritual personality with a physical body that is also unique. I’m sure you’ve all seen pictures of the once rather large families of your particular culture, and have marveled at how among a dozen brothers and sisters there is both such a family resemblance, and yet too how each face is unique: each physical person is unique. Even identical twins are ever so slightly physically unique. So right in the kinds of beings that you are—in personality, and spirit, and mind, you portray the gifts of all three of the absolute, existential Beings. This is what every human being is, and on Urantia, ever since Pentecost when I released my Spirit of Truth to the whole planet, as distinct from before this time, now every normal-minded human being receives a Thought Adjuster. As of Pentecost, the planet Urantia took a giant step forward into its potential future. …Mind is the holographic vortex interference phenomena whereby spirit realities become experiential to creature personalities. And in the last analysis the unifying possibilities of even human mind, the ability to co-ordinate things, ideas, and values, is super-material. …Spirit is the fundamental reality of the personality experience of all creatures because God is spirit. Spirit is unchanging, and therefore, in all personality relations, it transcends both mind and matter, which are experiential variables of progressive attainment. Always should the domains of the physical (electro-chemical) and the mental response to environmental stimuli be differentiated, and in turn must they all be recognized as phenomena apart from spiritual activities. The domains of physical, mental, and spiritual gravity are distinct vortex interference realms of cosmic reality, notwithstanding their intimate interrelations. It has been stated in the previous Papers that the physical chemical elements are the principal factors in the formation of the inorganic and organic matter, and are the prerequisite forms of matter necessary for the formation of the mechanical (non-teachable) mind, pre-life mind, and the teachable (non-mechanical) mind of the planetary life evolving through the planetary physical life-wave stages from the basic PUMA based holographic vortex interference elemental reactive consciousness to its ascending super-human Supreme mind potentials. The example of the action-reaction pre-life mind would be the mineral formation with the piezoelectric ability of crystals to respond to and retain certain frequency stimuli in their crystal body memory and to respond, i.e. communicate, when aligned with the frequency of the receiver. The beginning of the teachable (non-mechanical) mind begins with the introduction of the Life Spark and the Life Force through Life Carriers by Local Universe Creator Daughter (in case of this planet Urantia it was Nebadonia, see previous Papers on www.LighttoParadise.com) and the extension of the Life Force through the central PUMA of the first such electro-chemical cells via cosmic stations lines and the precipitation of the first biological material, such as primordial DNA, in the formation of the first electro-chemical biological cells of life. First primordial cells were simple and undifferentiated electrochemical circuits, established only from the reactive inorganic atomic-molecular components into which the life germ plasma was introduced with its ability to bridge the vortex interference frequencies of the adjacent spheres of consciousness surrounding the solar cell nuclear PUMA based ego-centric self. The first such organic units of material life created were the protoplasmic cells which communally associated various chemical, electrical and other basic energies. “…as you pray and as you aspire to make contact with God in heaven, you are creating a vortex in your reaching, understanding in this context that a vortex is energy that goes out and energy that comes in and it focuses on a time-space continuum. It is a large subject and one that is filled with imagery and potential understanding. It is a vast concept, and I will discuss an aspect of the vortex that includes the entire universe while my co-worker will address the more personal aspects of this energy experience. In discussing it for your mortal understanding, I will first make reference to your energy, going out into your environment and into your arena, as you are all individually a vortex of energy. You influence your environment with whatever energy it is that you combust within your being. It is possible for this energy to be constructive or destructive, but from a cosmic perspective, the energy that you emit is part of the growing godhead, the Evolving Supreme. Think of it as the ripple that spreads out when a stone is plopped on the pond. Holographic vortex interferences are evolution induced by any of the above mentioned type of minds, i.e. the mechanical (non-teachable) mind, pre-life mind, and the teachable (non-mechanical) mind of the planetary life evolving through the planetary physical life-wave stages from the basic elemental reactive interfering consciousness to the ascending super-human minds. 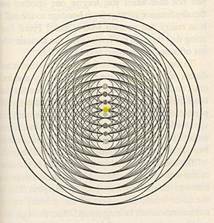 Below are shown the basic seven centers/wheels holographic vortex mind interference patterns (“the ripple effect”) presented in Picture 2. 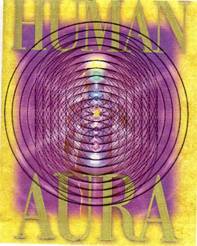 The seven human chakra centers/ wheels mind holographic vortex interference pattern would appear as presented below in Picture 3. 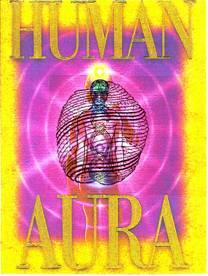 When seven basic human chakra centers/wheels are presented within the body of the expanding central Physical UltiMate Atom, as discussed previously and in Q-A Paper 45, then the human body holographic vortex interference aura appears as in Picture 4 presented below.